I'm back from a family reunion, and wanted to post the latest card that I made. It uses the stamp set The More the Merrier (a level 3 hostess set in the current catalog). The image is stamped in Basic Black Classic ink and colored in using the Many Marvelous Markers. The "happy birthday" image is from the Teeny Tiny Wishes stamp set. The base of the card is Melon Mambo and the scallops are done on Barely Banana using the Scallop Edge punch. 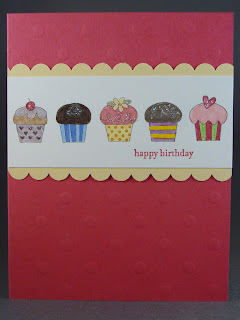 The final touch is adding some Dazzling Diamonds glitter, and the base card getting some texture with the Stampin' Up! Backgrounds 1 texture plates for the Sizzix Big Shot. I've been a Stampin' Up! Demonstrator for over 16 years. I enjoy seeing what a simple rubber stamp, some ink and card stock can become. And I especially enjoy it when someone who has never stamped before realizes that they too can be an artist. I'd love to share my love of rubber stamping with you. 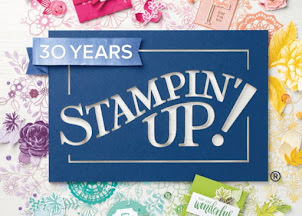 Stampin' Up!™ wants me to tell you...The content of this site is my sole responsibility as an Independent Stampin' Up!™ Demonstrator. The use of and the content of the classes, services, or products offered on my blog are not endorsed by Stampin' Up!™. Text and pictures © Amy Taylor; All rights reserved. Nothing may be copied or changed without requesting permission from myself alone. I have posted on here for personal inspiration only and you may not copy for submission to contests, magazines etc. Thank You for giving this your respect!! All products used are Stampin' Up!, unless otherwise specified. Sheltering Tree We'll Miss You! Christmas In July! Oh, Yeah!